Pretty much all magazine, catalogue printing and brochures are produced using the process described below. 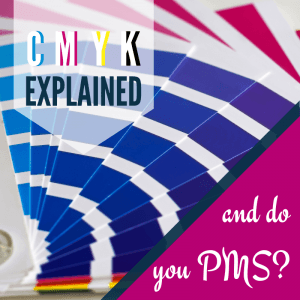 CMYK stands for Cyan, Magenta, Yellow and Key (aka black), which are the four-primary printing colours and are commonly seen in home inkjet printers. Cyan, magenta, yellow and black are mixed in different quantities to print a vast array of different colours. CMYK printing requires four colour plates, one for each colour and is known as four colour process (4CP), however some printing presses have 5 or 6 colour processes, which means that additional metallic spot colour or vanish can be added alongside the CMYK. It is also known as the subtractive method of colour printing because as the colours are layered to cover the white paper, the more ink that is applied the less light reflects through, hence subtraction of the white. CYMK is cost effective because only four ink colours are required and mixed according to each project’s colour requirements. CYMK lends itself to small and large print projects as well as managing multiple print projects on one printing press. However, replicating the exact colour hue again and again can be trickier as colours are not standardised across all printing presses so colours can vary slightly. PMS stands for Pantone Matching System and is a standardised spot colour categorisation system. Pantone colours are pre-mixed, so a specified Pantone colour code is always the same regardless of where and how it is printed. Pantone lends itself to projects where colour consistency and accuracy is important such as with branding and catalogue printing, because Pantone colours are pre-mixed. However, because Pantone colours are pre-mixed the range of colours needed is specific to each print project which makes it costlier. So, using a Pantone becomes more cost effective for large print projects where colour accuracy and consistency is important. RGB are red green and blue which is used on computer screens but is not used in printing. However, RGB can be converted to CMYK but not to Pantone. Due to the difference in the way colours are constructed in RGB and CMYK, any conversion is likely to result in colour changes. Never use RGB images in print ready artwork. So in summary, CMYK is good for any size of print projects and when accurate colour matching isn’t a priority, Pantone colours are best for larger print projects when colour consistency is critical. This guide is a ‘rule of thumb’ so please contact us on 01323 419701 to discuss your project requirements or email simon@cliffe-enterprise.com so we can advise you on what options will provide the quality and pricing you require. Feel free to look at our other blog posts on Brochure Printing, Fulfilment, Direct Mailing, Paper, Printing and News.